Who needs to buy Video Games for the kids? My son has already given me his Christmas list and of course it includes lots of video games. So I will be going to Best Buy this week since they have Buy 2, Get 1 FREE Nintendo 3DS games. I used a simliar deal to this last year to buy the games that his list. 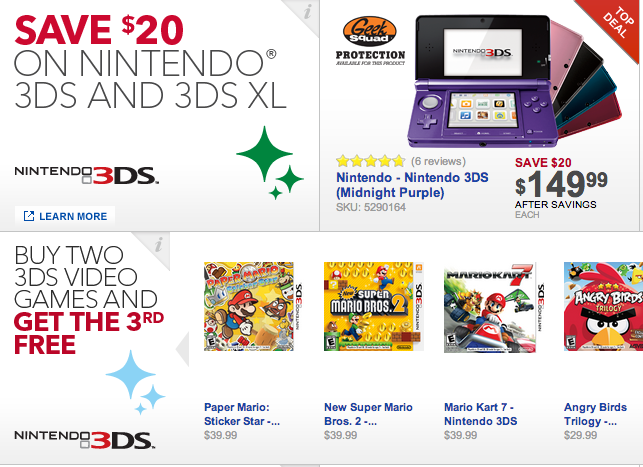 And for those looking to buy a 3DS gaming system, Best Buy has both the Nintendo 3DS and the 3DS XL on sale for $20 off.